Since Moss has last updated you, we’ve had a few tournaments to test our mettle in and a few high finishes in National events (although at this point I feel that everyone is all “Congressed out”). We’ll start our recap in sunny Clyde, which held the 5A Central Otago Teams and Pairs combo over the 8th/9th of September. Director Lindsay Gunn managed the round-robin teams and the surprisingly low-scoring Pairs event as well as she ever does, proving to be one of the top directors in the region. 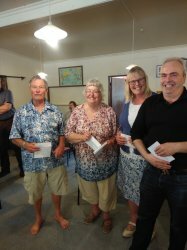 The next weekend saw the Wanaka Intermediate Pairs on the 15th followed by the Balclutha 8B Open Pairs on the 16th. I can’t report too much on the happenings at Wanaka, but maybe Lindsay could – seeing as she directed both of these tournaments too. Both of these events were much higher scoring than the Central Pairs, especially considering that John and Maria had a very comfortable lead after their morning session score of 73.02%. Two great sessions (both over 66%) saw a comfortable victory for this pair from Queenstown. Peter McCaskill (Dunedin), Jeff Thompson (Auckland), Richard Lapthorne and Neil Hawkins (Christchurch). Graeme Stout, Jeff Miller (Dunedin), Pauline Gumby, Warren Lazer (Australia). Senior Pairs: 1st Ernie Sutton(Queenstown) and Frances Sheehy (Oamaru). The next big event down South after Congress was the Otago Southland Congress for Labour Weekend (don’t say we are not imaginative). In a return to the hot weather of Clyde we saw players from Invercargill to Wellington compete. Jenny and Marion held on despite a 65.5% surge from Darryl and Deborah in the third session. The Congress Teams saw a format new to the South, with two pools of 8 teams play a round robin; with the top two from each playing a final and the rest playing a Swiss plate. Interesting things must have been happening at the Invercargill club that night. 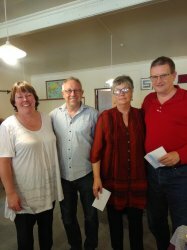 Tony Winters and Debbie Cooper posted a score very similar to their club-mates Jeff and Sherry Elton at the club; but saw their score increase by 9.77% while the Elton’s score decreased by 8.71%. While most of the changes from being scored nationally were of the order of a percent or two, these two pairs had the dubious honour of the largest changes from the region. a room full of happy players at the West Otago Bridge Club for the club's tournament in mid-October. and Steve Hardiman and Murray Speden (65.89%). The only big event coming up locally is the Nina Hewitt Christmas Pairs memorial event, although it’d be remiss of me not to wish everyone playing in the Inter-provincials and the International trials good luck. If West had passed at their second turn to speak then they would have found themselves on lead to 2 . This contract is obviously doomed, while 3 only needed spades to be 5-2 instead of 6-1 to make. While West had originally passed 1 anticipating their partner to reopen with a double for them to pass, and their double of 2 was unmistakably a penalty, the subsequent auction should alert them to the fact of extreme distribution around the table. Better to take the sure plus defending 2 than give the opponents another chance to escape.